Ian McLeod, Ian Gartside, John Ringrow, Chris Young, Michael Johnson, Peter (Hermann) Sebire. The site we used at Glenaladale is in a magnificent setting, with steep hillsides to the north and south. We used a site higher up the valley than the previous expedition, as the area at the Loch side was a bit wet! The area we used involved a walk of around a mile through a pine plantation to a clearing near a bend in the river. It was here that Glenaladale House used to stand until the '45 rebellion, when it was demolished by the Red Coats as retribution against the McDonald and Clan Ranald clans, for their part in the uprising. One of the most interesting places on Loch Shiel was the Clan Burial Isle which most people visited either in canoes or inflatables. Unfortunately, civilization is reaching the more remote points of the Highlands, and the Chapel Bell is now chained to the wall, since it was recently stolen, but luckily was recovered. The steep sided rugged mountains and deep gullies around the site filled with rushing torrents - especially when it rains, which it did almost every day. In fact, we had only three days when it did not rain! The wild life is quite varied. In addition to the deer, some of us sighted a badger in daylight - a fox was seen - and ptarmigan -whilst the highlight of the trip for me was watching a Golden Eagle sat on a ledge about twenty yards away. The main activities seemed to be canoeing and walking, as climbing was not possible most of the time because of the wet weather. Brian Barnes organised an Orienteering Event which most people enjoyed. Brian also organised the Sports Day. Unfortunately, during the practice for this event, we had our only casualty. Mike, putting the shot, was interrupted by Ian heading it! However, he survived my First Aid treatment and managed to reach Fort William for stitches, with the timely help of Bob Crockett and his tracked vehicles and boat. The marquee was rather a puzzle, as the two ends and the centre section seemed to be quite different - however, it only collapsed once - at 2.00 am in pouring rain - only the poor leader heard collapse of course! Rousing the whole camp at 7.00 am proved quite enjoyable, and after realising that breakfast could not be prepared until the marquee was re-erected, everyone threw themselves into the task at full strength, and breakfast was served at the usual time of 8.30 am! Almost everyone went on at least one bivvy trip, even though some of the destinations were a little suspect. I thoroughly enjoyed the expedition, and feel sure that the members and assistant leaders did too. 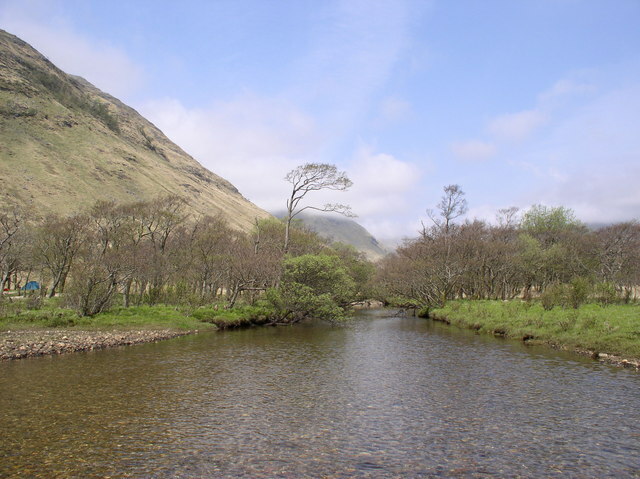 The campsite is in Glenaladale at ~NM824750 on the OS map. If you were on this expedition and have any information I'd be pleased to hear from you and add it to the site, but for now here is a brief description copied from the internet. 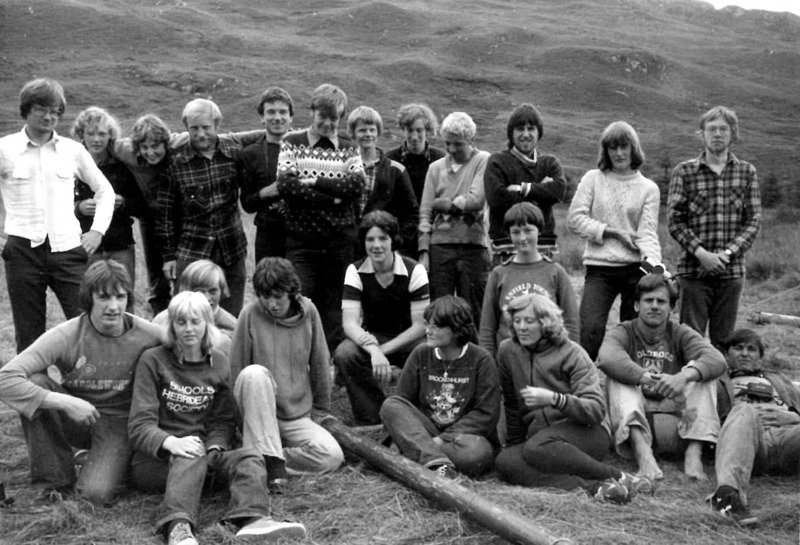 The Loch Shiel 1979 expedition members. Photo and some names thanks to Ben Buxton. Other help with names John Ringrow. 19)Debra Harrison 20)Julie Tinsley[behind 19] 21)Hubert Lelijveld 22)? Can anyone add more names? 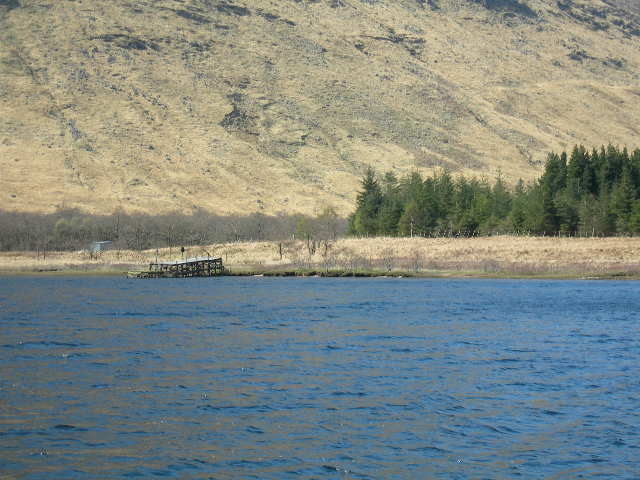 Jetty for Glenaladale estate, North side of Loch Shiel, 2009. At Camas Cròm. 'Loch Shiel is a long, narrow, freshwater loch in the Locharber region of the Highlands on the west coast of Scotland. 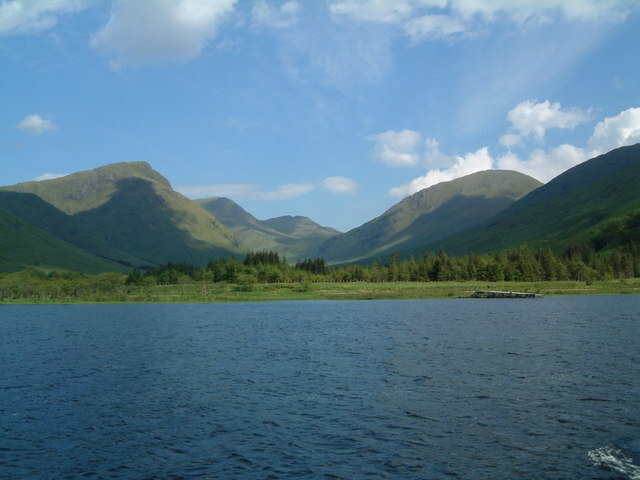 The landward end is near to Fort William and well known for both the Glenfinnan Monument and Glenfinnan Viaduct, both local tourist attractions. Loch Shiel is about 17 miles long and about 120m deep. It is fed by the Finnan River at the northern end, where it is surrounded by tall hills. 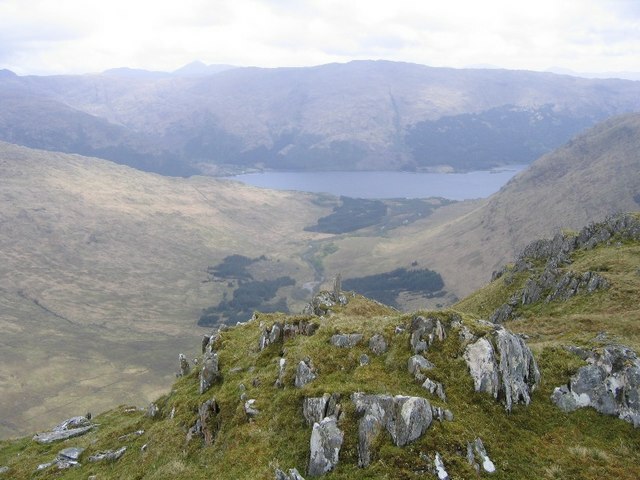 None of these quite reach high enough to be classified as a Munro, and are therefore rarely walked even though they are very picturesque. At the southern end, Loch Shiel drains into River Shiel which runs for 3 miles before draining into Loch Moidart, a sea loch near Castle Tioram. This superb conical hill is a long walk from whichever way it is approached. both of which can be seen in the photo. . The following '2nd' circular was also from Ben Buxton. Last week I paid a visit to Loch Shiel and Glenaladale. 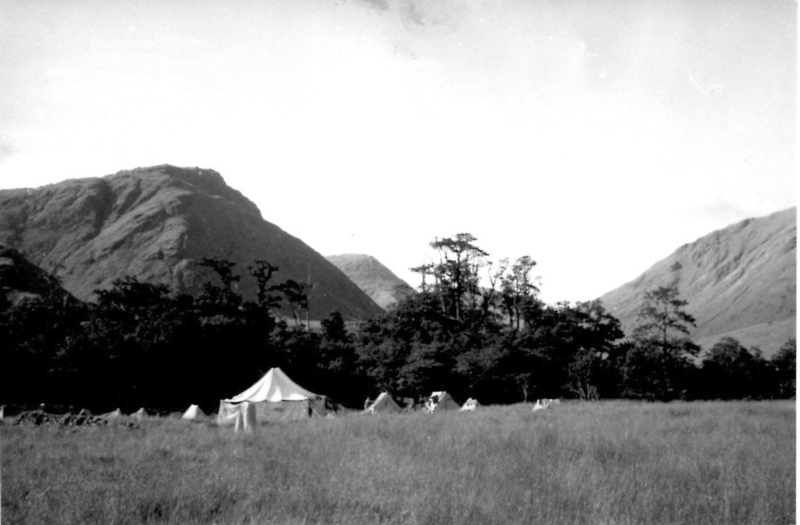 The camp site is a truly magnificent place, with the Loch only a few strides away. A wide valley is at the rear of the site: this valley contains a river, and is tree lined. The valley walls are steep, and lead to a very rugged mountain top. In the hills are herds of deer, amongst which at this time of the year are many young deer. The bird population seems to be very high and includes eagles. Transport is organised: we will travel from Glenfinnan to Glenaladale by boat, which will depart from the old McBraync's Pier at Glenfinnan after it has completed its daily cruise on the loch. This will be around 3 p.m. After loading all our equipment and ourselves, we should reach the campsite at Glenaladale by 4 p.m. This ought to give us enough time to erect the tents and prepare a meal before dark. Dr. Mike Hayward - has stepped into the gap left by the withdrawal of Richard Coaten. N.B. These groupings can be traded for days off to go on Bivvies etc. With this Circular you will find a copy of the Safety Leaflet -please read this carefully. You will also find some address forms which you should complete and return to me immediately. I shall be joining the train at Preston and hope to see most of you then I am looking forward to the Expedition, which should prove to be thoroughly enjoyable!